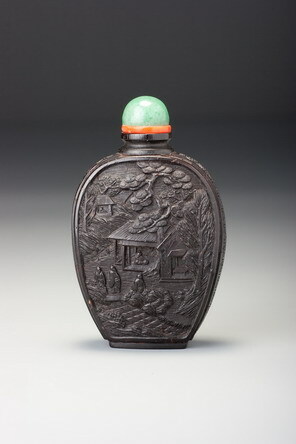 Gan Xuanwen used the literary name Fisherman of Gugang, which appears on one of his bottles in Hugh Moss Records, but on this example he signs Woodcutter of Gugang, using another symbol of the ideal country life and the wise observer of the rise and fall of dynasties who refuses to sully himself with human affairs. Gugang means ‘Ancient Gangzhou’, and Gangzhou, the modern Xinhui district of Jiangmen (a bit to the west of a line drawn between Macao and Guangzhou), was the last holdout of the Southern Song court against the Mongols in 1279. It was also the native place of Gan Xuanwen, so whether his signature is intended to identify him as a fisherman/woodcutter who remembers the fall of the Song as one example of the endless vanities of man or simply as a native of Xinhui is open to speculation. The dense, overlapping horizontal strokes that build up the impression of heavily foliated peaks are an obvious reference to the painting style associated with Mi Youren (1086–1165), who developed and established a style of painting mountains made up of a series of horizontal, wet ink-markings built up on each other. This would have been one of the most readily recognized styles to Gan’s fellow literati, any of whom could probably have recognized even more subtle stylistic references to dozens of other artists. And within it is kept an entire universe. It matters not whether the market price is high or low. 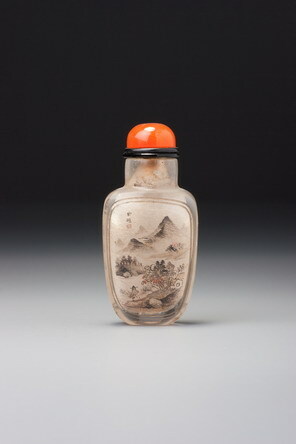 It sounds as if it was written by Gan or his friends specifically for a snuff bottle and endorses our belief that he and his circle of friends were well aware of the delights of snuff, and that Gan himself was somewhat of a connoisseur.